One of the most fun aspects of writing the book was bringing the story to life through the illustrations. I spent a lovely afternoon in Charlottesville taking photos of UVA grounds for the illustrator, with a special focus on taking pictures from perspectives that I could not find online. It was a perfect excuse for a quick visit to Charlottesville from Richmond. The day was beautiful and crisp and Grounds were buzzing with students enjoying the sunshine and warmer weather! My mom joined me and my nearly 1-year old son for the afternoon outing. 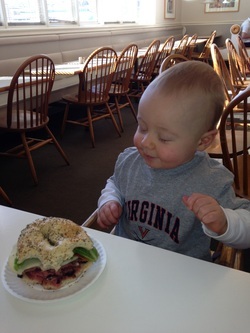 We started at Bodo’s Bagels to fuel up, and after a bagel sandwich and bojo we were ready to begin. 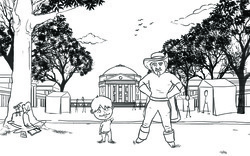 We divided the picture list into two categories: Central Grounds and the Corner. We tackled the Corner photos first and cruised Rugby Rd, 14th Street, Main Street, Gordon, and several other residential roads. We executed the “park, flashing lights, sprint around the car" technique, and successfully took every shot we needed without even a warning from the officers patrolling the neighborhoods around UVA. Next we tackled Central Grounds where we opted for the less daring "parking garage and stroller" technique. We captured scenes of the Lawn, Rotunda, libraries, the chapel, the serpentine walls, gardens, pavilions, amphitheater, Rouse Hall, and several other landmarks around grounds! before rush hour with lots of photos to provide the illustrator!